The Dunlop D402 has the official Harley-Davidson seal of approval, and it’s no mystery why. With a computer-optimized tread profile, three-ply polyester casing with two fiberglass belts, and an H speed rating up to 130 MPH, this touring tire will take you on a smooth ride over any road. Customize your tire with a black, single-white, or wide-white sidewall for the finishing touch. Dunlop's D402 is one of the premier motorcycle tires that deliver better traction and wear than the typical street bike tire. For the best performance in motorcycle tires the Dunlop D402 is hard to beat. The Dunlop D402 front motorcycle tire also has a compatible rear street bike tire as a great companion. The Dunlop D402 is the only motorcycle tire approved by Harley-Davidson® for its touring bikes. Built with a three-ply polyester casing with two fiberglass belts, the Dunlop D402 offers greater load-carrying capacity and stability. 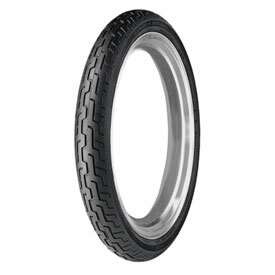 The Dunlop Harley-Davidson® motorcycle tire Series D402 is available in front and rear blackwall, single white bar, or wide white sidewall, all with an H speed rating. Wider MU85B16 rear tire is now available in black, slim white sidewall and wide white sidewall, and is load-rated up to 908 pounds. D402F MT90B16 is a front tire only and is not interchangeable with D402 MT90B16 rear tire. SW = Slim White Sidewall. I received my new tire within days of my order. Fast and accurate service was really welcomed. Would not hesitate to contact again for more parts.?? I will definitely recommend this company to all of my friends. The price and availability were within reasonable ranges. I bought this tire for my brothers 2001 Road King. It was easy to install and balance, he says it lasted more than 12,000 miles and he likes the fact it says Harley Davison on the side. Decent wear and handling. Would recommend based on value and tread life. Good quality and durability. Best price. Great price and most of all was at my door two days after ordering it! I like to stick with manufacturers recommended tires. So I purchased from Rocky Mountain. Great tire for my Ultra Classic and a great value for the money. Good grip and good traction. Excellent delivery time great price I would recommend this product highly and I will definitely be using there services in the future!!! This tire is actually on my 1980 FXS custom. The bike is sitting on a Paugcho hard tail "chopper" frame. This bike is fun to ride, but can be interesting to handle sometimes. This front tire has done great in all situations. Super fast shipping ----No review for the tires yet as I haven't had them put on yet. Shelf date was 1 year old on the front tire and 2 years old on the rear tire... Jake Wilson had the BEST price on the tires I bought. Good tire...fresh date stamp and delivery was on time..
Rocky Mountain provides fantastic service and the best price on a great product. I always replace my tires with the HD recommended tire and Rocky Mountain is my main supplier! Have an order for a rear tire in right now! the website is easy to use and the navigation around the site is also a plus. the prices thru rocky mountain has well beat other prices i've gotten and the free shipping made it even better. i will be for sure coming back for other acc's and parts i need. This was my second tire to buy from JakeWillson and in both cases very satisified with tires and services. I put almost 4k miles on my last front tire and have over 13k on this tire since the first week of June and it still looks great. I ride year round here in Utah, and have never experienced any problem with these tires. The great price from Rocky Mountain makes the purchase that much sweeter, no shipping? BONUS! Priced this tire several other places and Jake's pricing is outstanding will continue to buy my tires here. Great life, easy balancing tire. Great for stock replacement. Not the biggest grip, but solid feeling. I found the Dunlop D402 WWW I purchased from Rocky Mountain to be the best priced item anywhere. You cannot beat free, fast shipping, either. Kudos RM! I ordered Dunlop replacement tires and EBC pads for my 02 Deuce and they arrived in 3 days, as promised. Packaging was phenomenal. I checked the date on the tires, and the manufacture date code was 0811 (8th week of 2011). So, when your local "dealer" tells you that you're getting old tires or "non Harley" rubber if you buy from someone other than them, tell them they're sadly "mistaken". These things are fresh and even had Harley Davidson on the sidewall. Any time you need something for your ride, do yourself a favor and visit Jake Wilson. I am happy to say that I am now ready for Sturgis AND, thanks to Jake Wilson, I'm under my original budget for this year's trip. Any future needs for my bike, I'll check here first. WOW,...Service and Delivery Like Rarely Seen!!! As for the Donlop 402, this is my first time buying a Dunlop product, because I'm replacing the front tire of an '07 Ultra Classic HD I recently bought. Only replacing it though, due to it being a 4 year old, factory install when new. Tire replaced had almost 17000 miles on it and, could have easily reached 20,000, based on the remaining tread but, getting ready for Sturgis already and wanted fresh rubber. What I do want to mention though, being a first time customer of JW, is the unheard of 36 hour delivery time and, the unimaginable fully automated process of my calling their number to request a catalog and, all I had to do was "hit #1", since they had already programmed my mailing address into their customer records and BOOM, the catalog is on it's way. Fresh Tire; (by the date stamp); Best Price by at least $20 for the tire; unheard of delivery speed; and customer service galore!!!! First, BUT NOT LAST,....business transaction with Jake Wilson,....Keep up the great work! I have had used this tire on two different Harleys and I really like them. They have good traction even in the rain. They have held up well too. Happy with the purchase. I've always ran Dunlop D402's on this bike, and have always liked the ride so I've continued using them. VERY SATISFIED IN FLORIDA !!!!! Very smooooth transaction,very fast shipping right on time. Tire is in excellent brand new condition..Best price on this tire Anywhere..Highly recommend !!!!! Great tire for the best price! I ordered front & back tires on thursday & received them on friday! I checked everywhere for pricing and Jake Wilson cannot be touched. Thanks Jake Wilson, I'll be ordering from you from now on. I ordered this tire after my local shop said that they could bet me that this tire would be a leftover from a shop that closed and Jake Wilson bought their stock. After taking the tire into them to install it they were shocked, the tire had a build date of less than a month prior to my purchase. The shop said that for the price "I hit the lottery" there is no way they can beat Jake Wilson's price. Jake Wilson is where I will purchase all of my tires! You guys rock, keep up the great job!! I was given this tire and was wondering if I could use it for rear? BEST ANSWER: No, can not be used on the rear. Rear tire is designed for weight of the bike, torque, traction, ....etc. Front tires generate up to 80% of your stopping power, so having a more triangular shape is better for handling on turns and a thinner tread provides better feel. I would say no. For one it is z 21 incher. what is the next wider tire than a Dunlap D402F for my 2004 dyno low rider ? BEST ANSWER: HAve always used the 402 on my Heritage and Electra Glide. Best tires for my bikes. To me bigger sizes cause bigger problems so I've never used bigger sizes. Dealers would tell you the same thing.